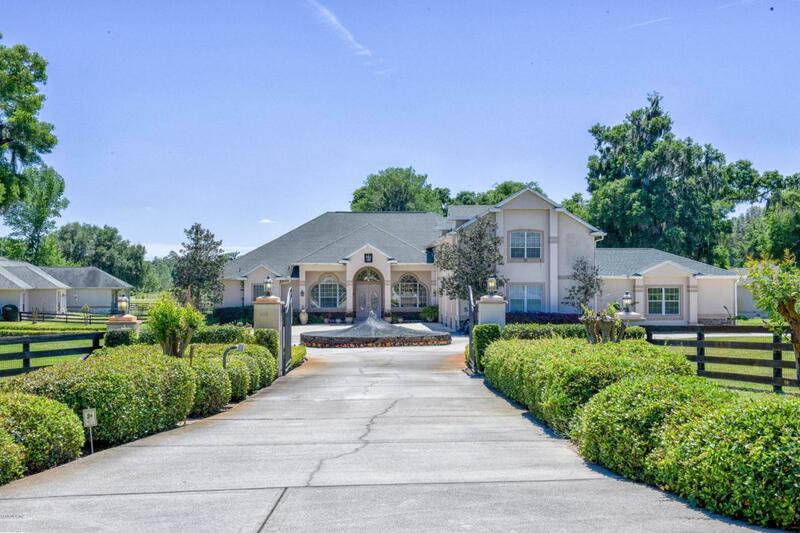 ONE OF KIND 18+ ACRE ESTATE IN SE OCALA! Gated entrance leads to circle drive & fountain w/majestic koi fish! Main home boasts 8 bedrooms - all w/attached bathrooms, an attached 6 car garage & more than ample space for entertaining! Master suite w/sitting area, his & her closets & vanities + sauna! Formal living rm & dining rm. Open kitchen features granite countertops, double wall ovens, glass top range, breakfast bar & breakfast nook just off of large family room w/fireplace. Huge enclosed lanai off of screened enclosed pool is perfect for entertaining. SECOND HOME is 6 bedrooms w/two car garage + a 1/1 inlaw apartment w/separate entrance. Back balcony overlooks pond w/fountain & river! Additional guest house w/2 bedrooms, 1 bath & small kitchen. Large horse pasture in back of property. Listing provided courtesy of The Meadows Team of Keller Williams-17 St Branch.